Three general types of reactors are used for biodiesel production: batch reactors, semi-continuous-flow reactors, and continuous-flow reactors. The batch process is inexpensive, requiring much less initial capital and infrastructure investment. It is flexible and allows the user to accommodate variations in feedstock type, composition, and quantity. The major drawbacks of the batch process include low productivity, larger variation in product quality, and more intensive labor and energy requirements. The semi-continuous process is similar to the batch process except that the producer starts by reacting a smaller volume than the vessel will hold and then continues to add ingredients until the vessel is full. This process is labor intensive and not commonly used. Continuous transesterification processes are preferred over batch processes in large-capacity commercial production because these processes result in consistent product quality and low capital and operating costs per unit of product. The most common type of continuous-flow reactor is the continuous stirred-tank reactor. Other types of continuous-flow reactors are also used commercially, including ultrasonic reactors and supercritical reactors. These alternative procedures can speed up the reaction. University of Idaho research shows that static mixer reactors and reactive distillation could also be used for biodiesel processing, but these processes are not yet used to produce biodiesel commercially. The batch reactor can be simply a tank that is equipped with some type of agitation. The tank is filled with the reactants for the process (in this case oil, alcohol, and catalyst), and then the agitator is operated for some period of time. After the required time has elapsed, the contents of the reactor are drained out and further processed. The main characteristic of a batch reactor is that it starts with unreacted material, causes it to react, and then at a later time ends up with reacted material. That is, a batch reactor contains different types of material depending on which time one happens to look at it. Batch reactors are generally used in small biodiesel production plants. A disadvantage of batch processes is that, to increase production, it might be necessary to increase the physical size of the plant by a proportional amount (by buying another reactor, for example). In contrast, when using a continuous flow process, it is usually possible to increase the plant’s production capacity by increasing the feed rate or shortening the reaction time. The most common continuous-flow system in biodiesel production is the continuous stirred-tank reactor (CSTR). At first glance a CSTR, such as that shown in Figure 1, appears to be identical to a batch reactor. In fact, often the actual reactor may be the same, but additional controls are needed to set the reactor up in a continuous-flow system. Some continuous-flow plants may be able to operate in either batch or continuous mode. In a CSTR, the reactants are continuously added and the product (mixture of different chemicals, including unreacted reactants) continuously withdrawn. Adequate agitation is required to ensure uniform chemical composition and temperature. The continuous-flow process typically requires intricate process controls and online monitoring of product quality. When a CSTR is operated continuously at a steady state, ideally the concentration of any chemical involved should be approximately constant anywhere in the reactor and at all times. In reality, this ideal state is rarely achieved; thus, adjustments need to be made to operating parameters to ensure complete reaction. Sometimes more than one reactor is used. In this system, approximately 80 percent of the alcohol and catalyst are added to the oil in a first-stage CSTR. Then, the reacted stream goes through a glycerol removal step before entering a second CSTR. The remaining 20 percent of the alcohol and catalyst are added to this reactor. This system provides a very complete reaction with the potential of using less alcohol than single-step systems. Ultrasound is a useful tool to mix liquids that tend to separate. In biodiesel production, adequate mixing is required to create sufficient contact between the vegetable oil/animal fat and alcohol, especially at the beginning of the reaction. Ultrasonic waves cause intense mixing so that the reaction can proceed at a much faster rate. Ultrasound transfers energy into fluid and creates violent vibrations, which form cavitation bubbles. As the bubbles burst, a sudden contraction of the fluid occurs, and the ingredients are mixed in the area of the bubbles. Such a high-energy action in liquid can considerably increase the reactivity of the reactant mixture and shorten the reaction time without involving elevated temperatures. In fact, this reaction can be achieved at or slightly above ambient temperature. Because there is no need to heat the mixture, energy may be saved. Research has shown that ultrasound can be effectively used in the production of biodiesel (e.g., Sarma et al., 2008; Hanh et al., 2008; Teixeira et al., 2009). The ultrasound processing results in similar yields of biodiesel with a much shortened reaction time compared to the conventional stirred-tank procedure. Ultrasound can be a good choice for small producers (up to 2 million gallons per year capacity), who may only need one or two ultrasound probes per reactor vessel. However, using ultrasound in large-scale processing may be challenging because many ultrasound probes would be needed to reach every area of the reactant mixture. Traditional biodiesel production requires a catalyst (usually sodium or potassium hydroxide) to complete the transesterification reaction. After the reaction, the catalyst has to be removed to ensure fuel quality. This can sometimes be problematic. To avoid the catalyst requirement, transesterification can be achieved in a catalyst-free manner by using a “supercritical” process. According to Introduction to Chemical Engineering Thermodynamics, a critical point of a fluid is defined by its critical temperature and critical pressure, “the highest temperature and highest pressure at which a pure chemical species is observed to exist in vapor/liquid equilibrium” (Smith et al., p. 64). At the supercritical state, the phase boundary between liquid and vapor starts to disappear, and the substance has qualities of both a liquid and a vapor. When transesterification occurs during the supercritical state of methanol (typically 300°C and 40 MPa/5800 psi or higher), the vegetable oil or animal fat dissolves in methanol to form a single phase. The reaction then occurs to reach completion in a few minutes without any catalysts. The supercritical process tolerates water and free fatty acids in the system, and the soap formation that is common in the traditional process is eliminated (Demirbas, 2006; van Kasteren and Nisworo, 2007; Saka and Isayama, 2009). Since the supercritical state demands very high temperature and pressure, the process can be expensive. Nevertheless, large biodiesel producers may find this process to be cost effective because, since the reaction happens so quickly, producers can make a large quantity with a relatively small reactor and limited space. Static mixers are simple devices consisting of spiral-shaped internal parts within an enclosure, such as a tube or pipe, that promote turbulent flow. They have no moving parts, are easy to use and maintain, and are very effective at mixing liquids that are not readily miscible under normal conditions. Biodiesel production from vegetable oils and alcohols is limited initially by the solubility of alcohol in vegetable oils (Van Gerpen and Knothe, 2005). Static mixers can be used to mix the reactants before they enter the reactor vessel. Can the static mixer itself also be used as the reactor vessel? 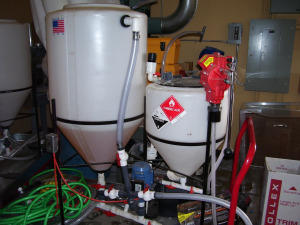 A study was conducted at the University of Idaho to explore the possibility of using a static mixer as a continuous-flow reactor for biodiesel production (Thompson and He, 2007). The results showed that the static mixer reactor was effective for biodiesel production, and products meeting the ASTM D6584 specification were obtained. As with other reactor configurations, temperature and catalyst concentration influenced the product yield significantly. The most favorable conditions for complete transesterification were 60°C and 1.5% catalyst for 30 minutes. It is feasible, therefore, to use a static mixer alone as the reactor for biodiesel preparation from vegetable oils and alcohols. A similar process is sometimes used commercially, but the use of a large static mixer as the biodiesel processor has not been commercialized. Reactive distillation (RD) is a chemical unit operation in which chemical reactions and product separations occur simultaneously in one unit. It is an effective alternative to the classic combination of reactor and separation units. Reactive distillation is a common chemical process in situations where the reaction may reverse itself easily. The RD technique removes the reaction products from the reaction zone, thus preventing the reaction from reversing, and improving the overall conversion rate. An RD system consists of numerous chambers with openings from one to the next. Ingredients are added to the first chamber, and as the mixture enters each successive chamber, the reaction progresses so that by the last chamber, the reaction is completed. Both packed and tray columns may be used for the RD applications; however, tray columns are preferred for homogeneous reaction systems because of the greater liquid holdup and the relatively longer retention time. Reactive distillation systems have not been used commercially in biodiesel production because RD tends to be a complex process. However, the complexity is somewhat minimized when applied to biodiesel production for a few reasons. The difference between the boiling temperatures of methanol and fatty acid esters (biodiesel) is so large that the separation of these two streams becomes very easy. Because the transesterification reaction occurs in the liquid phase only, the reaction time is then established by the total liquid holdup and the feeding rate of the reactants. According to research conducted at the University of Idaho sponsored by the National Institute of Advanced Transportation Technologies (NIATT) (He et al., 2005, 2006, 2007), the RD reactor system showed three major advantages over the batch and traditional continuous-flow processes: 1) shorter reaction time (10 to 15 min) and higher unit productivity (7 to 9 gallons per gallon reactor volume per hour), which is highly desirable in commercial production units; 2) much lower excess alcohol requirement (approximately 3.5:1 molar), which greatly reduces the effort of downstream alcohol recovery and operating costs; and 3) lower capital costs due to its smaller size and the reduced need for alcohol recovery equipment. Demirbas, Ayhan. 2006. Biodiesel production via non-catalytic SCF method and biodiesel fuel characteristics. Energy Conversion and Management 47(15-16):2271-2282. Hanh, Hoang Duc; Dong, Nguyen The; Starvarache, Carmen; Okitsu, Kenji; Maeda, Yasuaki; Nishimura. 2008. Methanolysis of triolein by low frequency ultrasonic irradiation. Energy Conversion and Management 49(2):276-280. He, B., A. Singh, and J. Thompson. 2006. 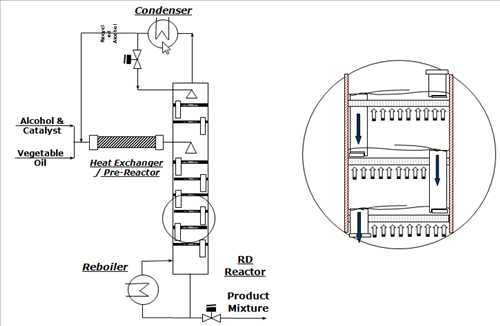 A novel continuous-flow reactor using reactive distillation technique for biodiesel production. Trans. ASABE 49(1):107−112. He, B., A. Singh, and J. Thompson. 2005. Experimental optimization on a continuous-flow reactive distillation reactor for biodiesel production. Trans. ASABE 48(6):2237–2243. He, B., A. Singh, and J. Thompson. 2007. Function and performance of a pre-reactor to reactive distillation column for biodiesel production. Trans. ASABE 50(1):123–128. Saka, Shiro, and Isayama, Yohei. 2009. A new process for catalyst-free production of biodiesel using supercritical methyl acetate. Fuel 88(7):1307-1313. Sarma, Anil K. ; Sarmah, Jayanta K. ; Barbora, Lepakshi; Kalita, Pankaj; Chatterjee, Sushovan; Mahanta, Pinakeswar; Goswami, Pranab. 2008. Recent inventions in biodiesel production and processing – A review. Recent Patents on Engineering 2(1):47-58. Smith, Joseph Mauk, Hendrick C. Van Ness, and Michael M. Abbott (2005). Introduction to Chemical Engineering Thermodynamics. McGraw Hill Professional. Teixeira, Leonardo S.G.; Assis, Júlio C.R. ; Mendonça, Daniel R.; Santos, Iran T.V. ; Guimarães, Paulo R.B. ; Pontes, Luiz A.M.; Teixeira, Josanaide S.R. 2009. Comparison between conventional and ultrasonic preparation of beef tallow biodiesel. Fuel Processing Technology 90(9):1164-1166. Thompson, J., and B. He. 2007. 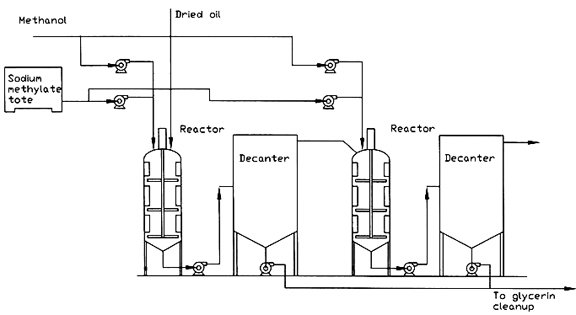 Biodiesel production using static mixers. Trans. ASABE 50(1):161–165. Van Gerpen, J., and G. Knothe. 2005. Basics of transesterification. In: The Biodiesel Handbook. pp. 26-41. G. Knothe, J. Krahl, and J. Van Gerpen, eds. AOCS Press, Champaign, Ill.
van Kasteren, J.M.N., and Nisworo, A.P. 2007. A process model to estimate the cost of industrial scale biodiesel production from waste cooking oil by supercritical transesterification. Resources, Conservation and Recycling 50(4):442-458.